"Are you looking for a dream place, away from the noise and pollution of the city, away from the crowd but still not too far? Take a look at the ""Holiday Farms"" farmland project, located within about .50 to 1 hour drive from the Jaipur city. ""Holiday Farms"" is a unique farmland project in the outskirts of Jaipur city in Rajasthan state of India. This is a typical farmland spread across more than 300 Bigha of land offering vacation stay in farmhouses and cottages made for vacation stay with all modern amenities similar to a resort. In this fenced and secured property, you can buy your own 500sq yards/4500sqft farm plots. If you live the crowd of the metro cities and like to have a piece of land of your own to spend some time away from the busy schedule, this is the place where you can get it an affordable price. Don't want to buy and build but just want to enjoy few days of vacation or stay over the weekends. 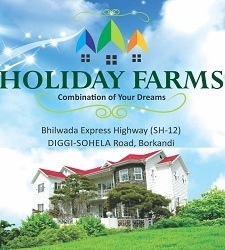 ""Holiday Farms"" is nestled with the nature, with a fabulous view of green area on all 360 degree. This place is one of the best gifts from nature and probably one of the most beautiful suburbs near Jaipur city." The Crown Group of companies is one of the premier land & property developers based at Jaipur, the "Pink City of India". Whether it's a development of a large sub - division, a new industry or even a single house, we The Crown Group is one of the largest real estate company in terms of revenues and saleable land bank in posh areas and prime locations .We have a track record of continuous growth, customer satisfaction and innovation. The Crown Group is one of the few groups who have made foray in the affordable housing in India. Our core business has been development of residential, commercial, Industrial and Township properties. The Crown Group has a very fine business model with earnings arising from real estate development and leasing with a stress on qualitative development. Its exposure across geographical segments reduces the risk against down cycle in the market. It is for this reason even in the present market conditions that the group has managed to scale new heights in term of planned development. Our group hopes to improve the lives of the people connected to us. The progress of our people powers the progress of our company. Every accomplishment becomes a foundation for us to do healthier, to dream higher, and create a better hope. Our responsibility, as industry leaders, drives us to be valiant and hold hard-hitting challenges.